Your Salesforce Dashboard serves multiple purposes as a center of operation, a visual representation of your reports, an organizational tool, a communication channel, and a lead generation tool. It might seem far fetched for a simple dashboard to have so many benefits, but we could easily think of even more advantages than these. 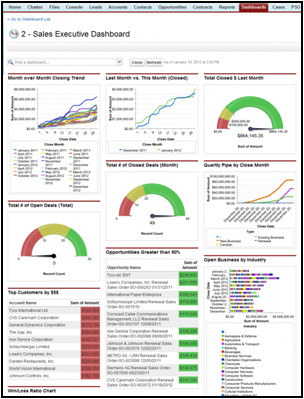 Basically put, the Salesforce Dashboard is a complete management tool for your business. Salesforce Dashboards converts the information from your source reports into one of several visual components. Depending on the type of data that you have, you could choose to use a table chart, gauge, pie, or a different kind of graph. However, charts and statistics are not the only thing that you get to work with. You can customize the entire dashboard and tailor it to your needs. The dashboard also helps you keep track of your schedule with a feature that you use to manage your customer tasks as well as your appointments. Your first thought is probably that this must be really difficult to set up. However, you can do it in a matter of minutes. The Salesforce team set up the Dashboard Builder as a drag-and-drop application. Simply select the source report that you want a chart for, pick the kind of chart you want, and drag it over onto the page. It really is as simple as that. You can then control who gets to view the chart as well as set up different filters for it. A filter allows you to view a specific set of information such as a particular quarter or product. Salesforce Dashboards provide you and your colleagues with real-time statistics and control of company information at your fingertips. The amount of time you can save by implementing this simple platform is substantial. According to a study, 4,000 Salesforce customers reported that they reduced the amount of time that they spent making reports by 52 percent. Since they were likely paying someone to create those reports, they probably reduced their budget as well. You can also use the Salesforce Dashboard as a tool to get more clients. Show them the visual representation of your company’s performance and offer to provide them with the same level of service. It is hard to ignore positive statistics, especially when the dashboard makes them look so appealing.